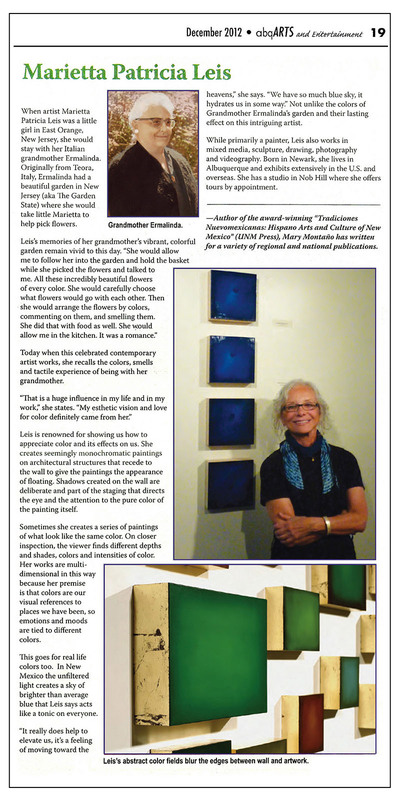 Mary Montano wrote this piece about my work in our local albuquerqueARTS magazine December issue. Hope you enjoy reading her insights. My painting, “Betwix and Between” was recently included in the Harwood Art Center’s (ABQ) 6th Annual 12×12 Fundraising Exhibit held on Friday, December 2, 2012. 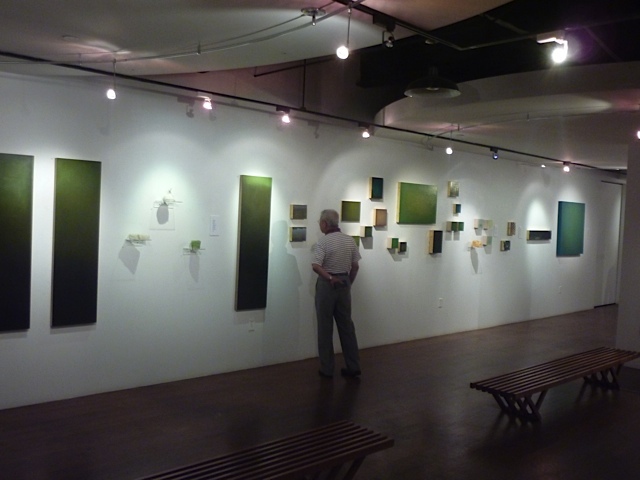 12×12 is a unique event where artworks donated by esteemed artists are sold to the public to benefit the innovative community arts program for children, teens, adults and families. Click here to read the weekly Alibi’s article for information on the event. 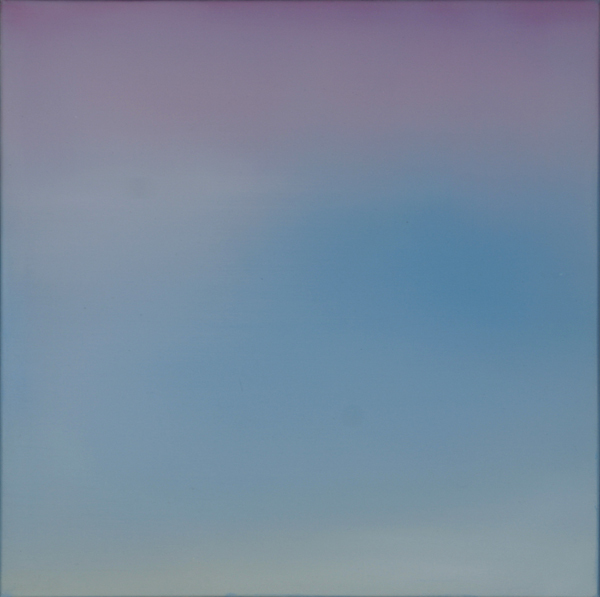 “Betwix” is part of my ongoing work using interference paint. Interference colors offer a unique “interference flip.” When viewed from different perspectives, interference colors flip between a bright opalescent color and its complement. Interference colors offer not just one “flip”, but multiple tones between two points on a spectrum. Interference colors offer a range of reflective properties and interplay with light. As my monochromatic paintings reflect the colors that epitomize the places of my travels. My intention for using interference paints is to both enhance and mystify the “stories” of these places. So cool to turn on my Monday computer and find this little gift. Thanks to Serena. 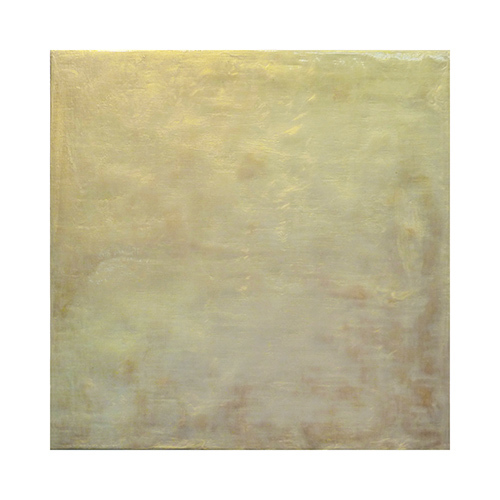 Tramonto I & II, oil/wood, 24 x 24 x 6"
You are now able to sample 4 of my current oil on wood paintings in the Shades series called Pixels at Gallery Sonja Roesch, Houston. 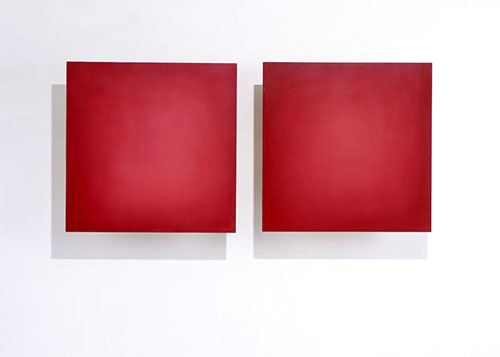 These are intimate reductive works that can exhibit singularly or in dramatic groupings. 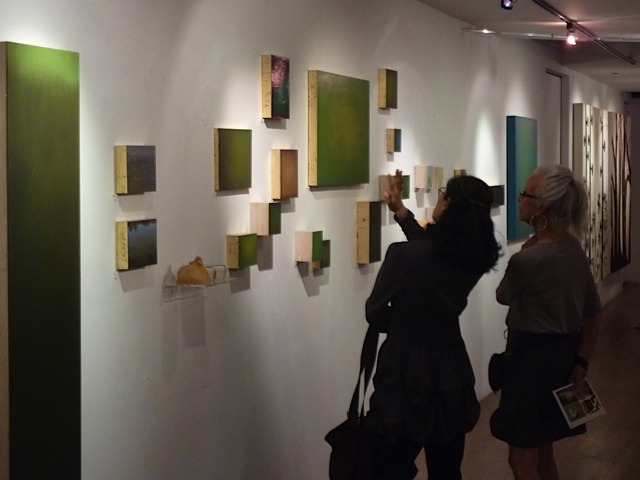 Pixels’ wood framing recedes to the wall in a pyramidal shape that makes the paintings seem to float. This creates wonderful mysterious shadows. Each of the paintings tells a “story of place” capturing the essence of my travel experiences by not allowing the noise of everyday to enter. 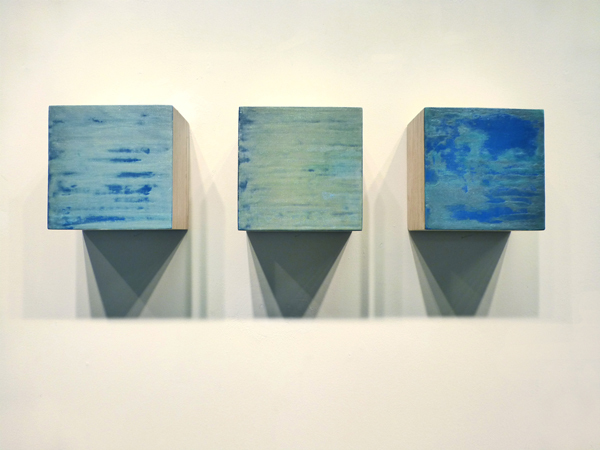 These are quiet, contemplative works. My use of a limited palette is to convey the predominant colors of an environment. Color conveys the mood of a place and of its people. 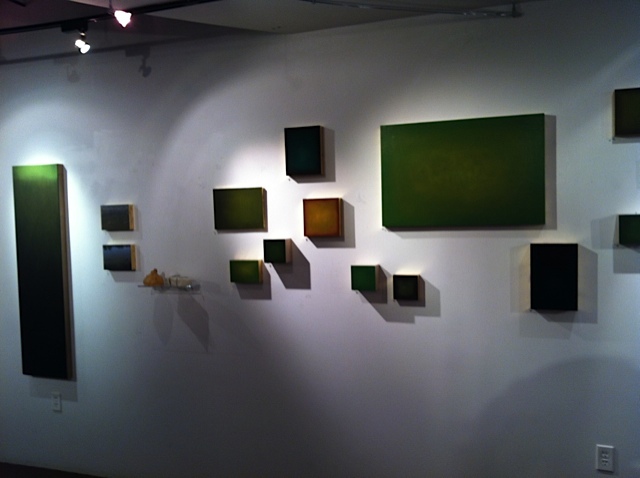 In their very simplicity the paintings are lush and to be enjoyed. 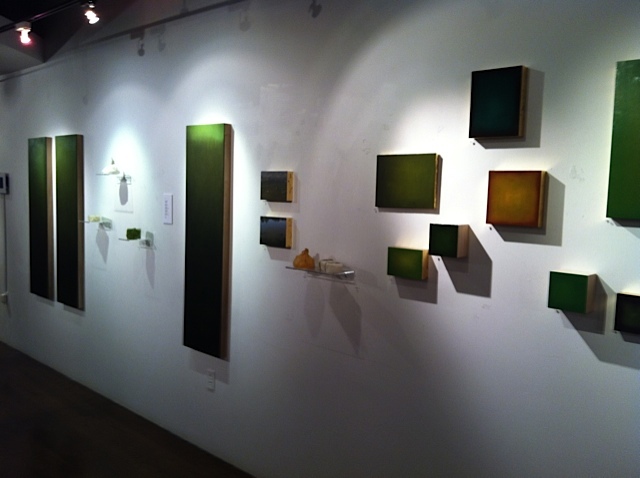 I hope you have an opportunity to visit Gallery Sonja Roesch! This is the story of an exhibit I did in 1983-86 that toured for 5 years. I wanted to retell it here because it was such a labor of love and I wanted another opportunity to share it with those of you that may not know it. I’ve included some of the images and poems and Lucy Lippard’s essay about the exhibit. All my research papers are now archived at the Valenti Italian Library at the University Library, Seton Hall University, NJ. Many years ago I was reading a book that was an anthology of women artists when I came upon a couple of paragraphs that told of Marietta Robusti Tintoretto. As people have speculated, it was her name that particularly attracted me to her story but not because it was my name. I was named for my mother and it was because of my mother that the story originally intrigued me. Of course Tintoretto was just one of many women artists whose lives were depicted in the book. Almost all the stories told of struggles, hardships and careers forsaken or overshadowed. But Marietta’s story was emblematic of all the stories. Marietta Tintoretto’s story stuck with me. In 1994 I applied for a grant based on the Tintoretto story to The E.D. Foundation and when they awarded me the grant I devoted the next two years of my work to Marietta’s story. It took some research a good deal of trial and error before I found a format that felt right for the question I was asking which was, “why did women find validation in the arts so difficult to attain?” I addressed this question by focusing on issues that Marietta Tintoretto faced and incorporated those into the paintings. The three largest paintings were the first pieces I completed which are composed of fractured elements because women often get fragmented by their various roles. That fragmentation makes focusing on a career in the arts difficult at best. The elements in these larger paintings take on many guises that, for me, symbolize Venice, the Renaissance and my ideas of Marietta’s life. They are my commentary. 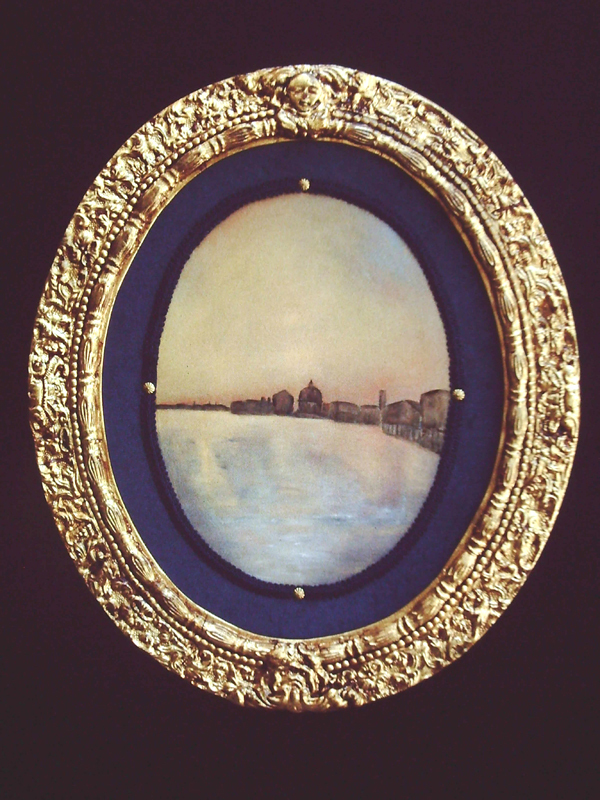 The oval paintings of Venice depict the context for the story, a place of much grandeur and love of the arts. Venice had a great influence over the West. It was (and is) an enchanting place that paradoxically harbors dark stories and times. 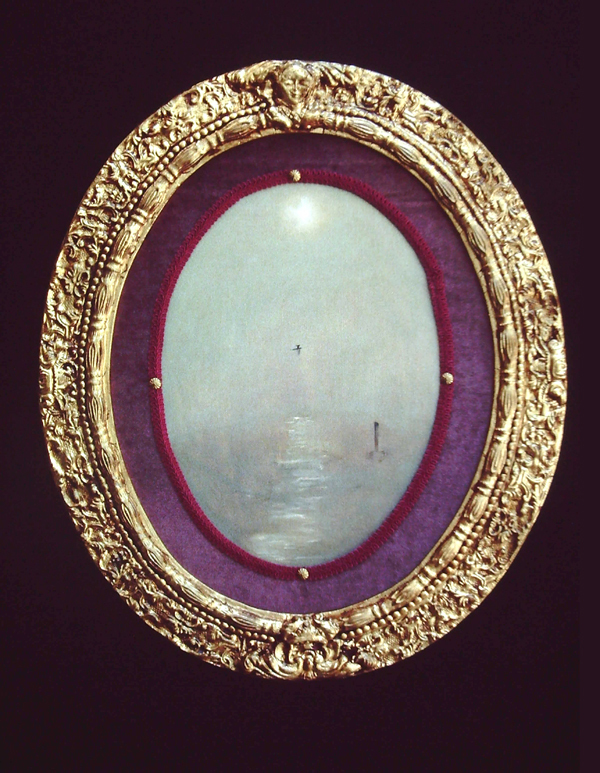 The smaller paintings with fabricated frames are like the small formats that so many women artists use. They whisper instead of shout and one must become intimate with them. The frames were constructed of many different media that reminded me of the way some women can seemingly make ‘something from nothing,’ whether it’s dinner or a dress. I used different configurations of the only picture references that I had of the cast, Marietta’s father, Jacopo Tintoretto, Marietta herself and the one painting that is currently attributed to her, Old Man and a Boy, to express different thoughts I had about her story. The project took a lot of incubating and starts and stops. I discarded some of my early attempts to distill the story to its essence. I had a grand time building the frames with pieces that I cast from molds that I made from some personal, meaningful objects. 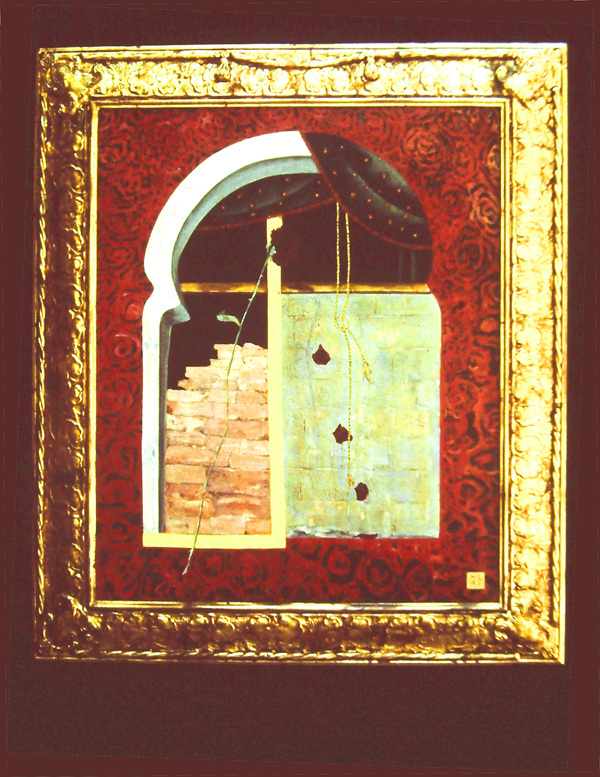 I loved the oil paint and the luscious colors and derived great pleasure from the gold leafing. I was raised in an ‘old world’ home and the imagery and materials that I used in Marietta’s story seemed familiar. They held both nostalgia and aversion for me. Perhaps the final work retains some of that tension and contradiction. In this work I want to present the idea that there are many things in our own minds that can stop us, even when the opportunities to fly free present themselves. I use the historical context so women artists can better understand those forces, internally and externally, that both drive and deter them. I have attempted to embody in this work the things that influence us both good and bad. Through telling Marietta’s story, I gained an understanding of my mother’s decision—away from a career in the arts that was so demanding and risky. My intent is to be non judgmental and generous because after all, I am my mother’s child and thus this story is mine as well. 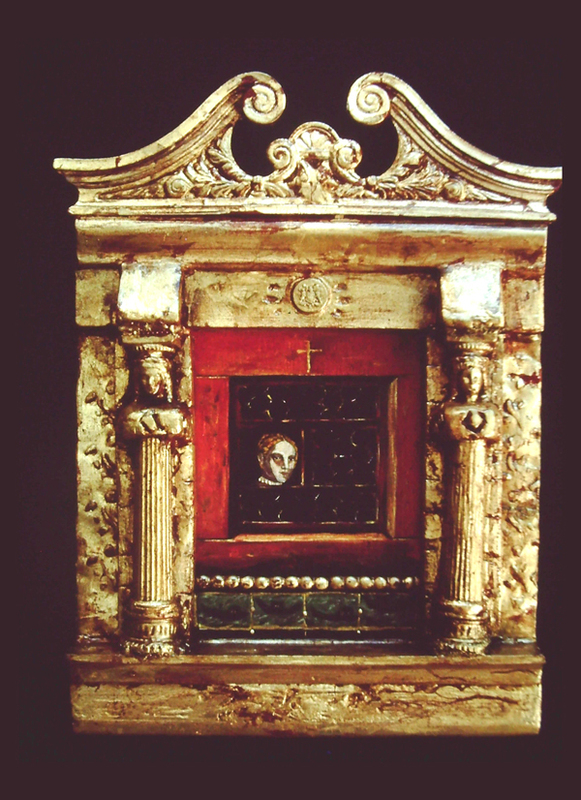 Marietta Leis is reframing the life of Marietta Robusti Tintoretto, who died 400 years ago. She does this literally by making ornate gold frames an integral part of the work; and she does it figuratively, creating a series of metaphors for today’s women artists. Leis weaves invisible references to her own life with more visible references to that of Marietta Tintoretto. 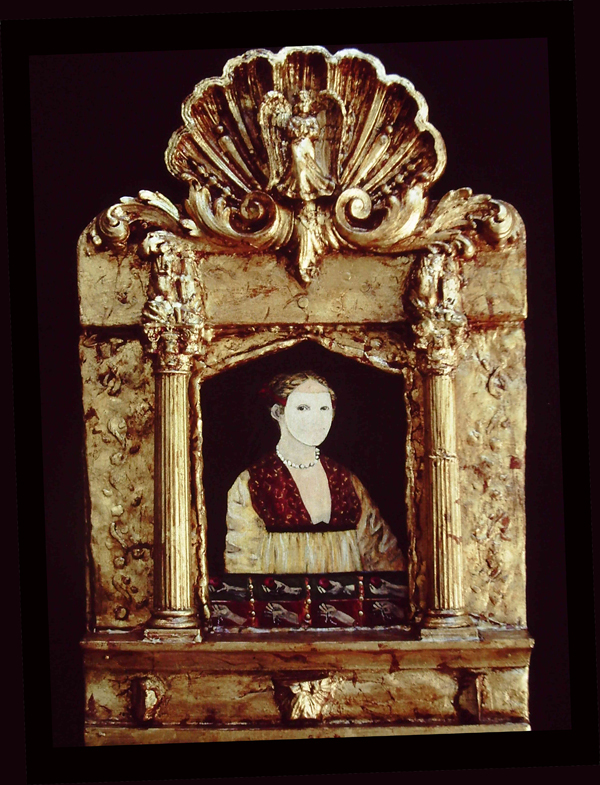 The frames are cast with significant personal belongings, and she was attracted to the Renaissance artist because Marietta was also her mother’s name, and her mother had decided not to seek a career in the arts. Thus, with the aid of a feminist consciousness, a classic 20th-century woman’s story was contrasted with the total support that Tintoretto received from her famous father who dressed her in boy’s clothing, taught her all he knew, and was delighted by her success as a portrait painter. Even as a married woman, she stayed under her father’s roof (and Leis suggests that the father-daughter bonds were so strong that Marietta never found her own voice). Yet no sooner had she died in childbirth at the age of thirty, Tintoretto’s work began to be forgotten, until today scholars definitively attribute only one painting to her. This is precisely why women artists have to think seriously about “posterity”; it is why Judy Chicago is making such an effort to have her feminist icon—The Dinner Party, permanently housed; it is why so many women artists look anxiously to museums to care for their work. It is, above all, why we know so little about our feminist art history. For centuries women artists’ work has been disappearing, sometimes beneath better-known male names. It is already possible to see the history of the most recent wave of feminist art (beginning in 1969-70) being hidden, forgotten, and rewritten by those who were not there. Leis’s exhibition of lyrical, painstaking homages to another Marietta brings these issues to the foreground. At the same time, her works serve as bridges from the sense of formal beauty we inherit from the Italian painting tradition to today’s feminist investigations of opulence and reclamation. 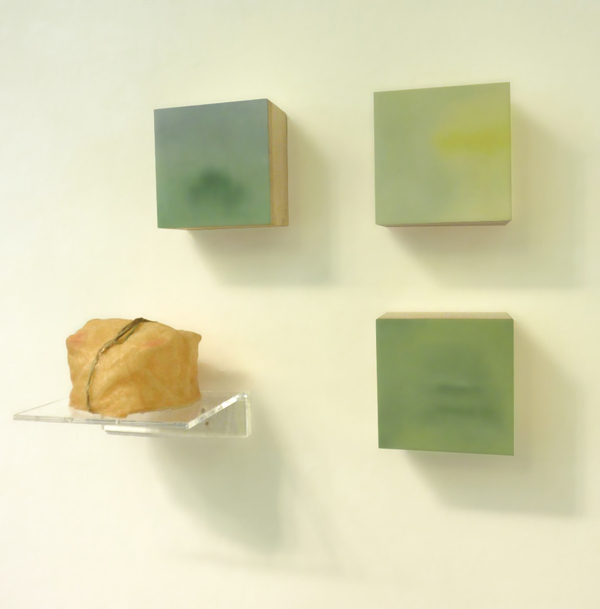 Even as their loving detail makes a point of scale, and their fragmentation makes a point of history, the very weight of these small works belie their size. They join Chicago’s Great Ladies, May Steven’s monumental Artemesia Gentileschi, and Miriam Schapiro’s homages to Mary Cassatt and other foremothers to whom all feminists must pledge memory, lest our contemporaries also be lost. These elegant frames protect both the art of Marietta Tintoretto and the art of Marietta Leis. * Written for the brochure for the exhibition Excerpts from the series: The Marietta Robusti Tintoretto Story at the Jonson Gallery of the University of New Mexico, Albuquerque. Marietta Robusti Tintoretto was the exceptionally beautiful daughter of the celebrated Venetian painter, Jacopo Tintoretti. Favoring her above his other children he saw to her education by dressing her as a boy so it would be possible for her to accompany him everywhere. 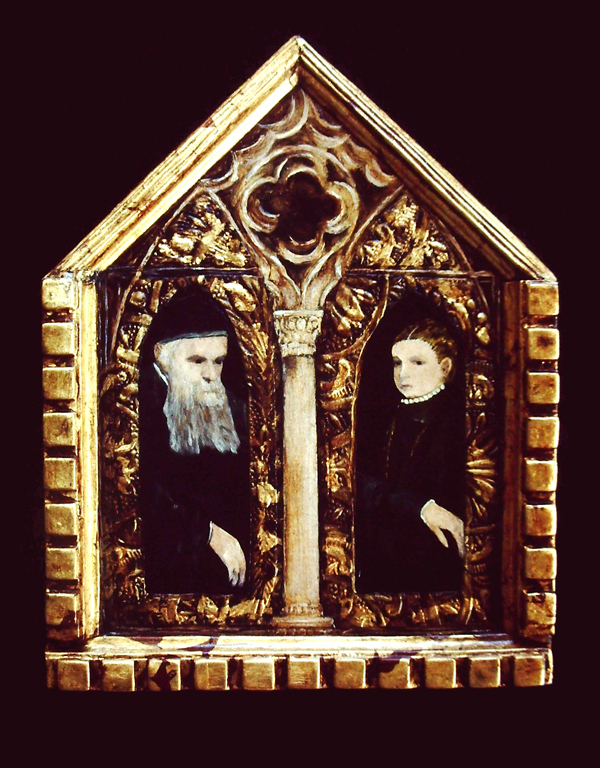 By painting at his side she learned his renowned painting techniques and often did the backgrounds of his works. Entire works originally assigned to her father have since been reattributed to Marietta. 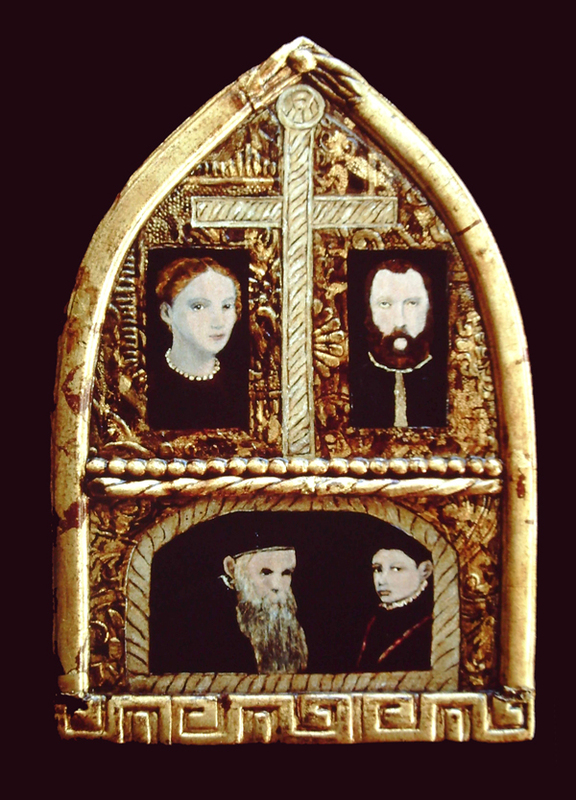 Here portraiture also acheived success and she was invited by three royal houses to be their court painter. Marietta refused all offers to leave her father’s house and did not marry until a suitor agreed to live under the elder Tintoretti’s roof. She died one year after the marriage at the age of thirty leaving a grief stricken father whom, some said, never recovered. 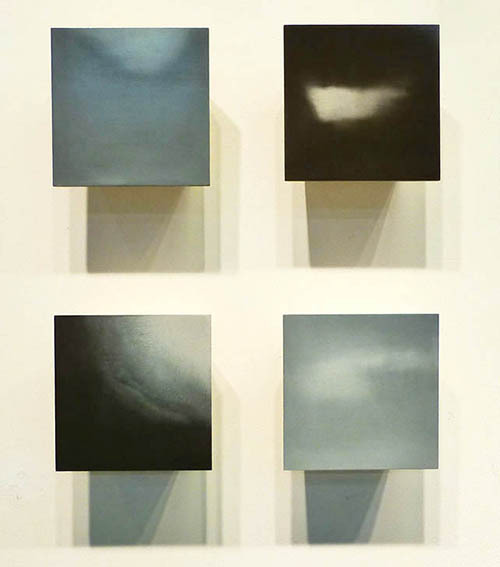 My paintings, Limning 1, 2, and 4 are to be included in a group exhibit entitled Lo Studio dei Nipoti (The Studio of the Grandchildren, Nieces and Nephews) at the Hillyer Art Space at the International Arts and Artists in Washington, DC. September 7th-28th. The exhibit, curated by Cianne Fragione and Rose Michelle Taverniti, features artists that have family ties to Southern Italy. It evolved from an artist residency of the title’s name that Taverniti initiated to help these artists form a connection to their roots. Limnings are abstract paintings that reflect my travels on the Southern Coast of Italy by the Tyrrhenian Sea and will exhibit together as a grouping. 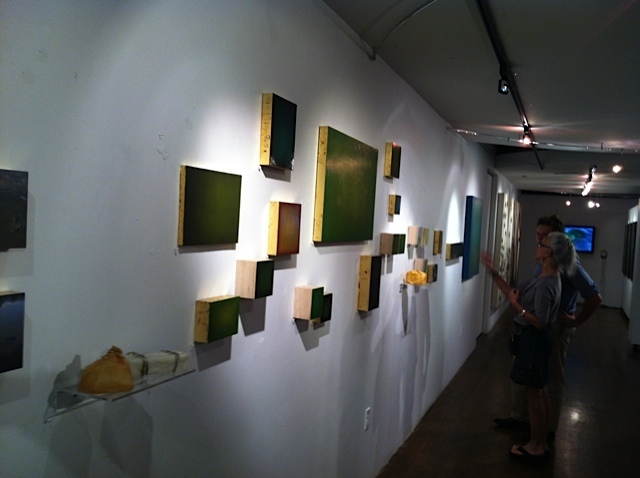 More details of the exhibit can be found on the Hillyer Art Space website. I hope you’ll have an opportunity to see the work of these wonderful artists. 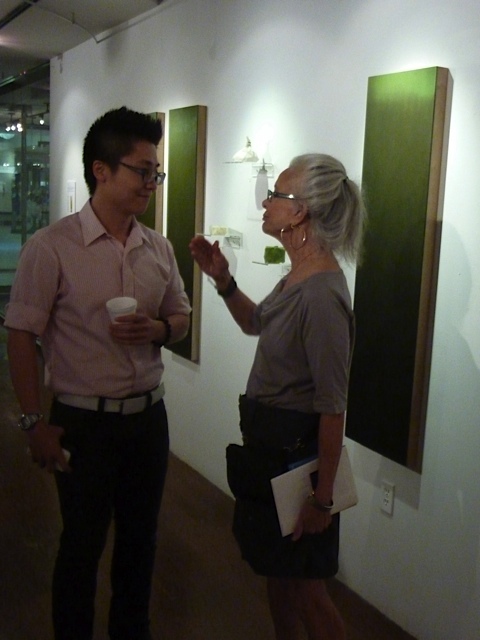 Young-Sook Park, Gallery Director at Park Fine Art in Albuquerque, NM, has organized and curated a group exhibit with international artists that will travel to Beijing, Seoul, Istanbul, and conclude in Albuquerque. I am delighted that my oil painting Ballad 4 will be included in this touring event that enables my work to be shown in far away places. It is always one of my favorite events! The tour will open in Beijing September 1st and finishes it’s tour November 16th. 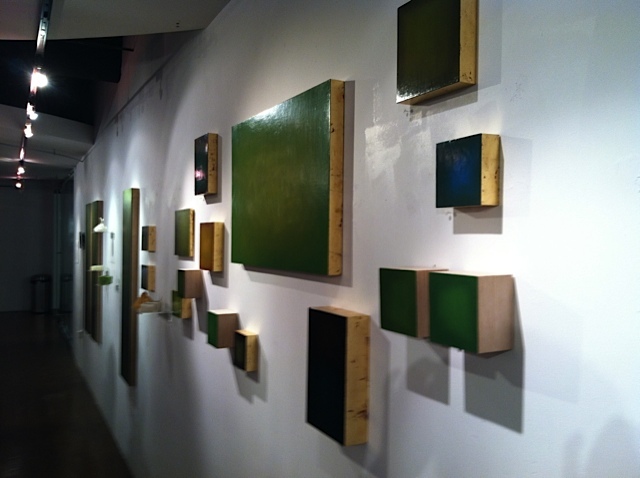 More information can be found at http://parkfineart.com/Announcement.aspx. Surprisingly, I did this painting in 1983! Not like my reductive work of the last decade plus, eh? It’s a 72” x 52” oil on canvas painting from a series entitled Mosaics. 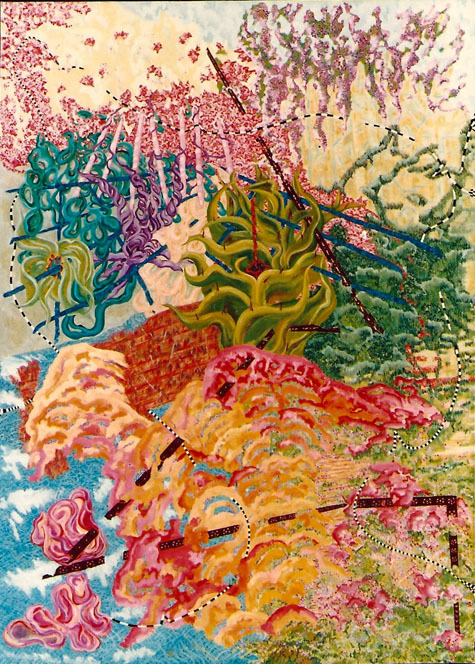 That group of complex work used fragmented compositions of flora and architecture as metaphors for man and nature. Mosaic XIV came back into my world vision when someone in Ohio emailed me that she had been given it by an Ohio company for work rendered and wanted some information about me and the painting’s origins. My inventory system provided the details of where the work was made, when it was finished, where it was shown, the consultant who had sold it to the Ohio company, and the sales price at that time. I also dug up a postcard announcement of the painting that advertised an exhibit of the Mosaics in Chicago. It’s obvious that my work has changed in appearance although my concerns are still color and the natural world and I use architectural formats. I’ve kept a few pieces from this series for myself but seeing and enjoying this painting again makes me want to let the others out into the world. It is a special feeling to see my older work and appreciate it. “Well done, good work”, I say but it is like saying it about someone other than myself—a younger person in a different time and place. A chapter of my life that in part I’ve left behind but one that had work I can admire. My multimedia exhibit, GREEN: a paradox of abundance and scarcity, will be one part of a two person exhibition at Carr Gallery at Willard Arts Center (Colonial Theater), Idaho Falls. 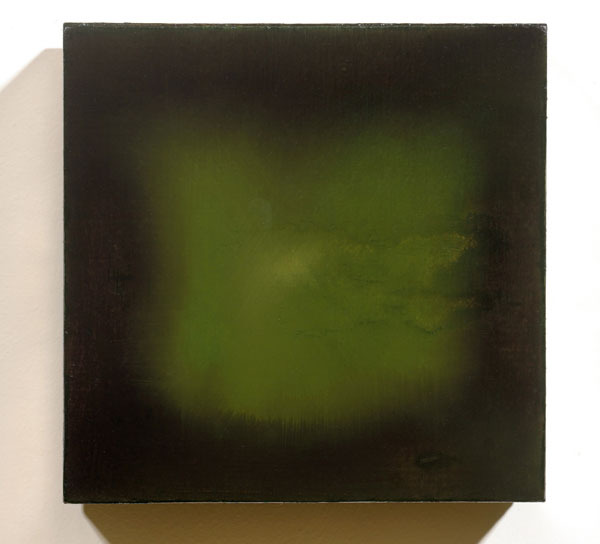 The entire exhibit in the 2000 sf gallery is entitled, Environmental Considerations: New Works by Marietta Patricia Leis and Omar Sarabia, and is being presented by The Idaho Falls Arts Council. The exhibit opens July 14-September 1 with a reception Thursday August 2 starting at 5pm. More of my work can be found at www.mariettaleis.com and examples of the GREEN exhibit can be seen on this website at >portfolio>green. 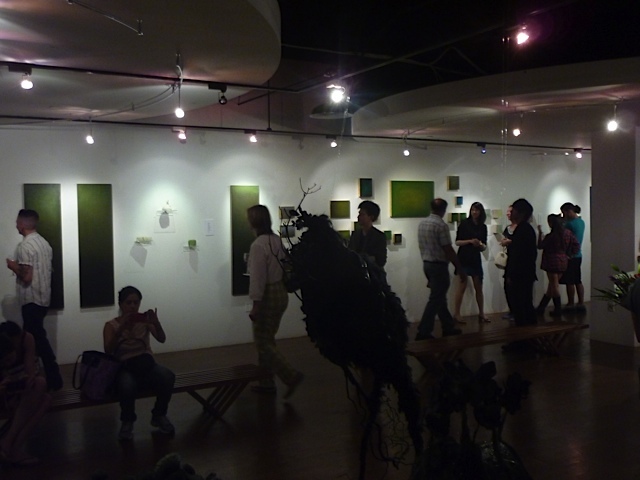 Thirty-two multimedia works from my exhibit, GREEN: a paradox of abundance and scarcity will be shown in the exhibition, Going Green II at Crossing Art. Crossing Art will be showing seven artists in this exhibit June 16th – August 16th at their wonderful gallery space in Queens, NY. My work will include monochromatic paintings, poetry texts plates, a video, and hollow, pseudo-food beeswax sculptures that convey the paradox of an unequal world. I will be attending the opening reception 3-6 pm on the 16th. 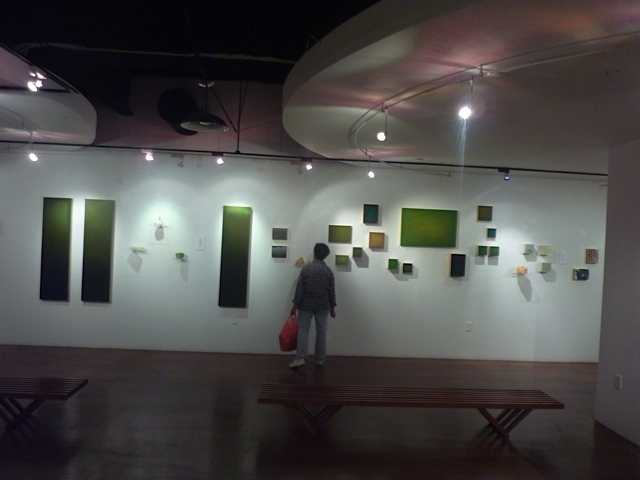 Going Green II is an annual exhibition that supports not only an eco-friendly environment but raises issues about the current trends and future fate of urban landscapes. I’m very excited to be part of this year’s, Going Green II, the second annual group exhibition of local and international artists, will be on view at Crossing Art in conjunction with this year’s QAX. The Queens Art Express is a spring arts festival of performance, events, exhibitions, and great places to eat in the vibrant cultural communities of Queens NY — along the route of the No. 7 train and beyond.